Looking for a sport tourer? 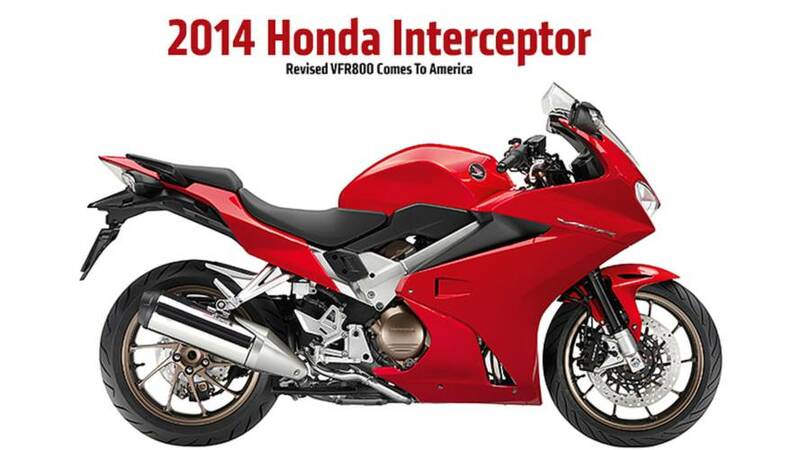 Based on the old VFR800, the 2014 Honda Interceptor could be just right and it will be on sale in the U.S. in May of 2014. Starting at $12,499, the 2014 Honda Interceptor fills a huge void in the sport touring segment, delivering a "just right" amount of size, weight and performance at an affordable price. 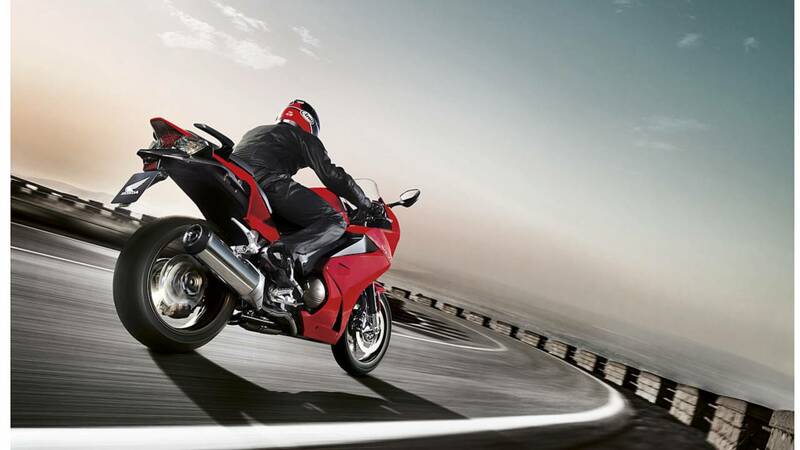 This new 2014 Honda VFR800F was unveiled at EICMA but, until now, U.S. availability has been an unknown. 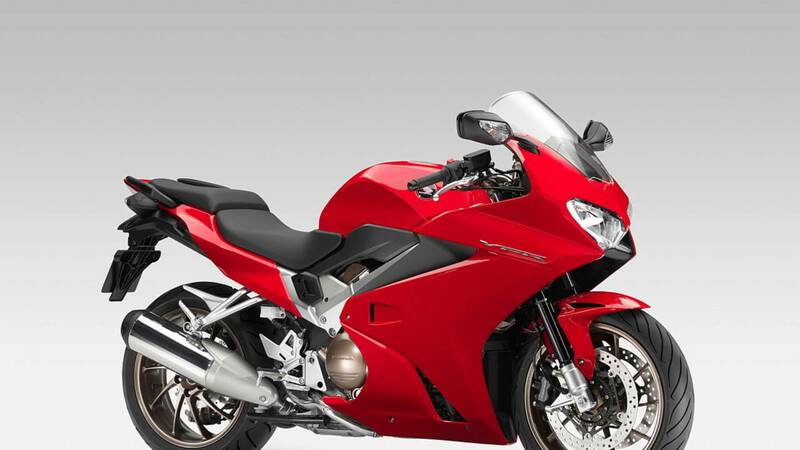 This new machine is based on the last-gen VFR, last sold here as a 2009 model. 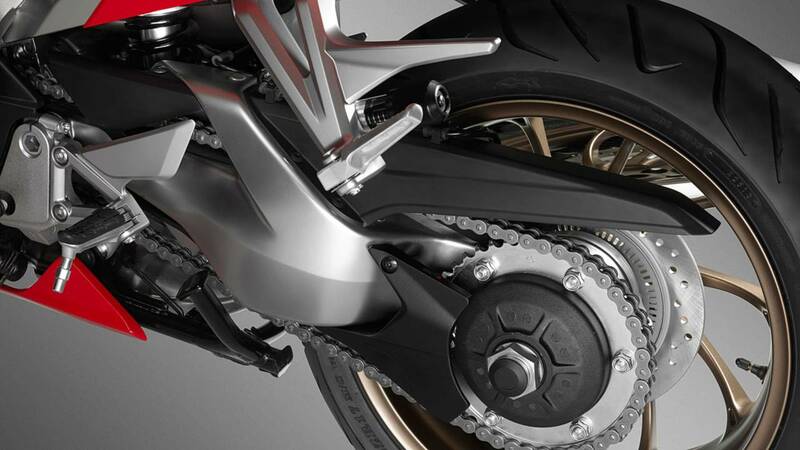 Over that bike, this new one ditches the dual, side-mounted radiators in favor of a single, front-mount arrangement. Combined with a new, lighter single-sided swingarm and lighter subframe, that drops weight by 22 lbs to just 529 lbs fully-fueled. 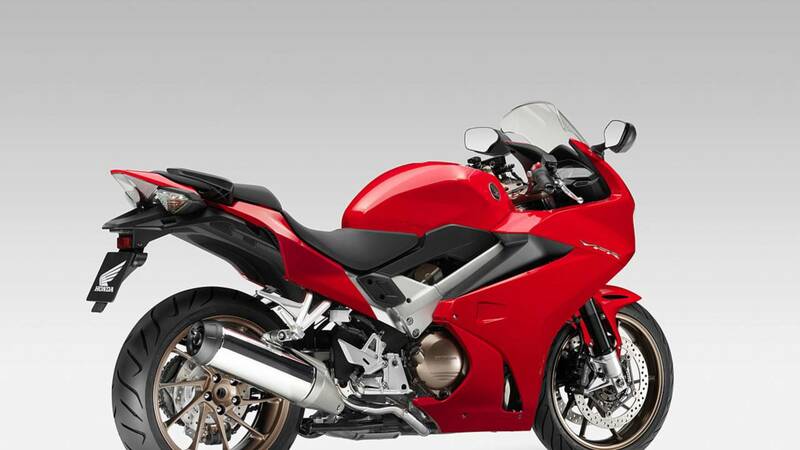 Power and torque from the 782cc V4 are 105 bhp at 10,250 rpm and 55 lb.-ft. at 8,500 rpm. Before you ask, yes, this new bike is still equipped with Honda's controversial and now out-moded VTEC variable valve timing system. So equipped, the motor has a noticeable kick in the powerband when the valve duration and lift is altered to deliver more performance. 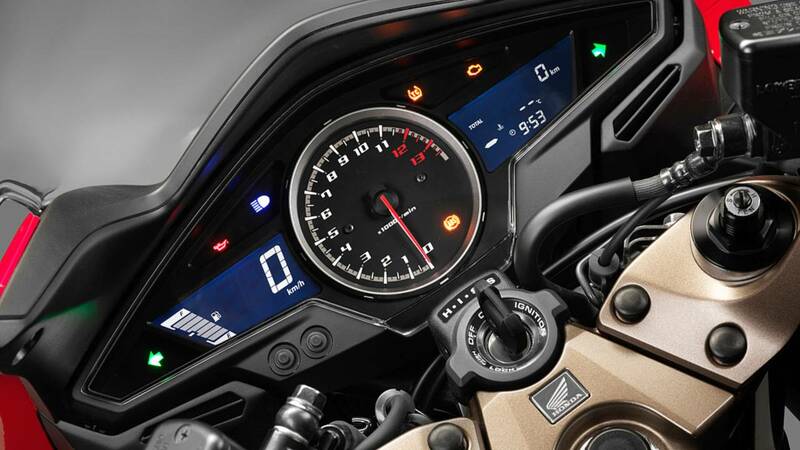 The 2014 Honda Interceptor's styling is clean and purposeful. The NACA ducts on the side pay homage to previous generations of VFR. A "DLX" or Deluxe version will cost $13,499 and adds traction control, ABS and self-cancelling turn signals. 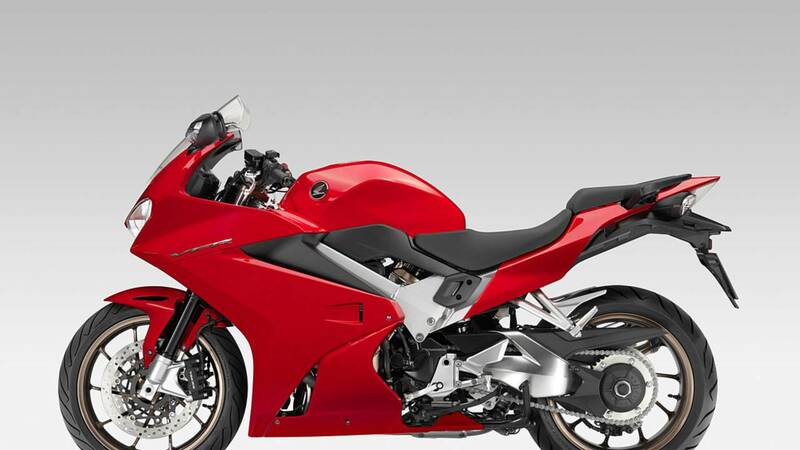 Additional changes over the much-missed old model are a new, slimmer fairing, LED headlights, a new exhaust canister and radial brakes. Sales set to start in May. 2014 Honda Interceptor left side profile. What do you think of the Interceptor's "magnesium" colored wheels and engine covers paired with the silver frame? Yes, Virginia, there is a standard centerstand. The Interceptor should be perfect, whether its highway or backroad. The cockpit is straight off the old bike. That's not bad thing, its digital speedo/analog tach were ahead of their time.